Bedlington Terrier Dog Breed Garden Planter - our Bedlington Terrier dog breed garden planter is designed for outside or inside use. The perfect outdoor decor for the Bedlington Terrier dog lover. So many possibilities of where to use - on a deck - sitting on a front step - or even in the house on a table. The Bedlington Terrier Dog Breed Garden Planter is made of pine - the box is coated with a deck stain/sealer. The bottom is made of perforated PVC plastic for drainage. It features a single 2-dimensional hand painted breed head. Overall dimensions: 9 1/8" x 9 1/8" x 8". Inside dimension: 6 3/4" square. Perfect for a 6" Pot. 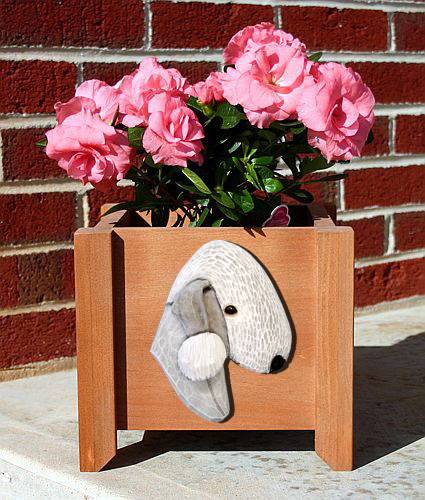 Our Bedlington Terrier Dog Breed Garden Planter is made in the USA.